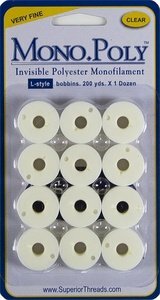 Super Bobs Cotton are prewound bobbins in both L-style and Class 15 sizes that are wound with MasterPiece 50 wt. 2-ply Egyptian-grown extra-long staple cotton thread. MasterPiece bobbins create precise stitches, have very little lint, and each bobbin lasts longer due to precision winding. These bobbins hold 30-60% more thread than a self-wound bobbin. 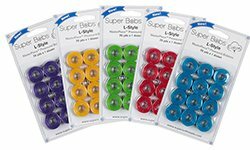 Super Bobs Cotton bobbins are available by the dozen and in special 25-bobbin collection sets. Each bobbin contains 215 yds. of Bottom Line 60 wt. lint free polyester thread. 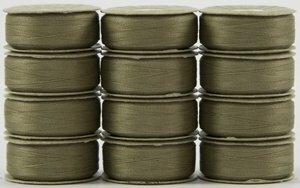 MonoPoly prewound bobbins are available in Class 15 (220 yds. per bobbin) and L-style (200 yds. per bobbin), and are wound with MonoPoly monofilament polyester. Available in Clear and Smoke.